Nearly half of American adults have high blood pressure, increasing their risk of heart disease, heart attack, and stroke. If you have hypertension or a family history of the disease, you can count on board-certified internist Shawn Veiseh, MD, for expert medical care and advice to help you lower your blood pressure and improve your health. He offers blood pressure screenings and appointments at his private practice, University Executive Physical Program, in the Westwood neighborhood of Los Angeles. Call the practice or make an appointment online today. Your blood pressure is the force exerted on the insides of your blood vessels as your heart pumps blood through your body. Blood pressure is measured in two numbers: your systolic and diastolic measurements. Your systolic number is the force exerted in millimeters of mercury (mm Hg) when your heart beats. Your diastolic number represents the force when your heart rests between beats. A healthy blood pressure reading is 120/80 mm Hg or lower. If your systolic number is between 120 and 129, your blood pressure is considered elevated, even if your diastolic number is still 80 or less. However, once your blood pressure creeps above 130/80 mm Hg, it’s considered stage 1 hypertension and puts your health at risk. High blood pressure doesn’t usually cause noticeable symptoms until your health is at serious risk. The only way to know if your blood pressure is healthy is to have routine screenings during your annual exams or regularly check your blood pressure at home. While genetics and family medical history contribute to your risk of high blood pressure, your lifestyle can lead to hypertension. For example, if you eat a poor diet that’s high in salt, fat, and sugar, you increase your risk of high blood pressure. Similarly, if you lead a sedentary lifestyle or are overweight or obese, your risk increases. And, of course, smoking takes its toll on your vascular health. Some instances of hypertension are even triggered by pregnancy. 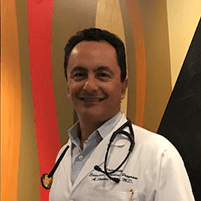 Dr. Veiseh approaches treatment for high blood pressure with a combination of lifestyle modifications and advice to improve your overall health and lower your blood pressure. He suggests changing your diet to a heart-healthy plan that includes plenty of fresh vegetables, fruits, whole grains, and lean proteins. He also advises you to get at least 30 minutes of moderate exercise every day. Changing your diet and exercise habits helps you maintain a healthy body weight and improve your overall health. If your blood pressure is very high or unable to be sufficiently controlled through lifestyle changes, he can also prescribe medications. These include diuretics, ACE inhibitors, calcium, and beta blockers to lower your blood pressure. If you’re due for a physical exam and blood pressure screening, call Dr. Veiseh to schedule an appointment online today.